All three were large, good-looking, big-chested dogs; excellent markers with go-power. This pedigree is strongly based on lines from FTC Timber Town Clansman and Dual CH Treveilyr Swift. The combination of AFC Black Mike of Lakewood and FC Tar Dessa Venture has directly produced at least 8 Field CHs!! Another closely related dog of similar type was CH Elyod's Lucky Linus. This is Longplain Rowdy Bunch CD (by Eli's A Comin' ex Longplain Wild Plum) showing off her water entry at just 5 months old! Her brother sired our longtime premiere stud, Longplain Suntar. 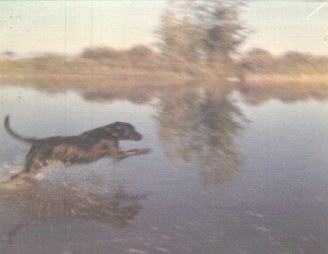 Our 1976 litter by Eli ex Plum (a Salmon/Tushai daughter, herself a wonderful marker and water dog) consisted of 5 black males, 2 black females. They were big, strong, solid pups, 100% sound (AFC Black Mike of Lakewood was a remarkable influence for excellent hips), and spectacular workers -- six were retrieving from ice water at 5½ weeks old! One had already brought in 40 ducks and 20 geese by 5½ months! FC-AFC Dessa's Little Tar Baby, FC-AFC Dessa's Black Angel, FC Swing Tarzan Swing; 3 more with allage points!